object: a colony of ants (messor structor), poppy seeds, gypsum, equipment, plaster, acrylic, glass, water. Gypsum used for constructing artificial ant houses was also a traditional material for sculpting Soviet ideological busts and bas-reliefs, and a transparent film reducing the amount of light that gets in is red – the favorite color of the Communists. The materials of the builders of communism and those of the owner of ant houses accidentally coincidence producing a certain rhyme, but Marx’s view of human communities is so entomological that the rhyme itself does not seem accidental. 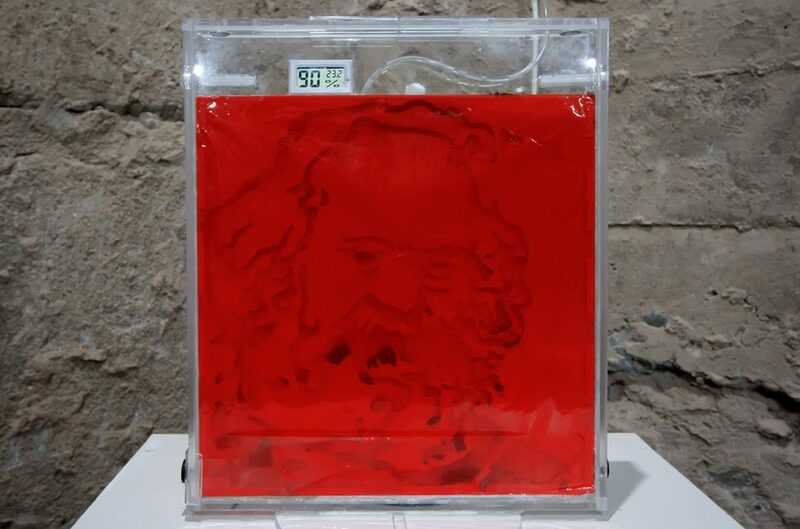 Formicaria measuring 45×35 cm with strokes and chambers in the form of a portrait of Karl Marx, which is gradually populated by ants in the course of the natural growth processes of the colony. All the conditions for the rapid and proper development of the anthill are observed, including the traditional darkening film of red color. Strokes and chambers, made of plaster, add up to a portrait that will grow darker with the growth of the colony and manifest itself more and more.